Oj Oj Oj! - NUL POINTS! No, this section is not about the infamous American footballer, rather it’s a tribute to the biggest serial crime in Eurovision history, namely the scandalous treatment of Norwegian Eurovision entries from the mid sixties through to the mid eighties when they finally hit the jackpot with La Det Swinge. The author of this web site would heartily agree with those comments. So this page is a humble attempt to pay tribute to those criminally neglected songs. Off stage, there was one man whose influence was behind most Norwegian songs of this era. Arne Bendiksen, performer in 1964, and frequent songwriter after that. 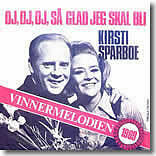 Kirsti sang three times for Norway, the first before the Norsk barren period began in 1965. In those attempts she accrued just 4 whole points, that’s 1,2,1. An abject jury disgrace. Her 1967 song “Dukkemann” was a dreamy, jazzy song, and 1969’s fabulous “Oj Oj Oj” owed quite a lot to Sandie Shaw, but there have been far worse “Puppet” clones. In 1970 with no Norway in the contest Kirsti took part in the German final. In 1994 she recorded a Silver Jubilee version of “Oj Oj Oj”. In 1973 the Bendik Singers attained a rare top 10 placing for Norway with the vocally complex “It’s Just A Game”. The two female members, Anne-Karine Strom and Ellen Nikolaesen went on to represent Norway in the next 3 years (Anne-Karine twice) without any success. Anne-Karine’s 1976 effort “Mata Hari” was a classic disco belter that deserved far better. Anita sang “Casanova” in London in 1977 and caused a stir for all the wrong reasons. The BBC filmed preview videos in a bar but Norwegian TV didn’t like such scenes of debauchery for their singer so they forbade the transmission of the videos, hence the sooo-boring shots of the audience between the songs. In 1979 Anita returned with another winsome number “Oliver” but was not significantly more successful. Three years later she joined forces with husband Jahn Teigen. 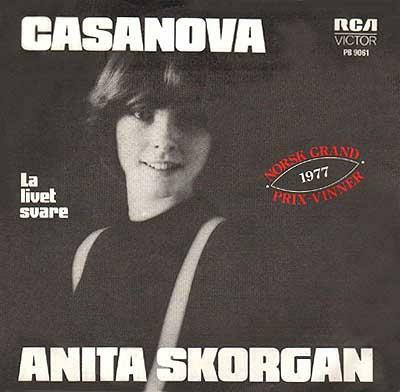 Three decades after her Eurovision exploits, Anita Skorgan has found an army of new fans in the UK!. Radio 2’s Jeremy Vine started championing her music and the listener response has been such that her seasonal album “Adventus” has recently been given a full UK release to much critical acclaim. Just a shame that the blurb asserts that Anita “won” Eurovision in 1977. Sadly she in fact finished 14th. Jahn’s first effort is of course legendary and documented elsewhere on this site. Three years later he teamed up with wife Anita Skorgan and achieved a much better result with “Adieu”. A year later he sang “Do-Re-Mi” solo and actually cracked the top 10! Little Hanne and her parasol skipped on to the Dublin stage in the favoured last in the running order, but sadly could only beat the Maltese. Hanne had the last laugh in 1985 as one half of Bobbysocks. A bearded Scandinavian called Benny takes to the Eurovision stage in the early seventies…. and sails home 14th in a contest strangely packed with similar cutesy couples. A regular guy with a guitar and an inoffensive tune, then half way through the song stops and an ethnically dressed guys enters stage right chanting something completely different. A political and uncompromising entry that garnered points from four countries. Finn came on right just before the Bucks Fizz stage show. He wore what looked like a football shirt and sat on a chair strumming a guitar in low-key style. 0 points. Two blonde lovelies with a highly fancied entry – well they were anyway. A somewhat ropey vocal performance in Luxemburg City. No matter, Norwegian salvation was just around the corner.